Remote entry to @party. I'm not sure if it actually got shown as it should, I just watched the stream and it was just black and then the last few seconds of the demo was shown. Hopefully the party visitors got to see all of it! Oh, and since it was quite easy (only minor memory location and charset changes) I ported it to both the C64 and the C16/Plus4. always nice to see demos on non standard hardware! Cool! 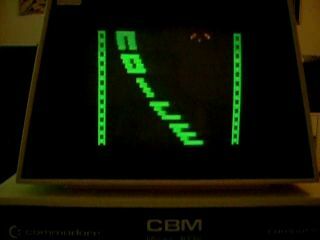 This is probably the best demo I have seen in Commodore Pet (I don't know others :). Pretty nice, you should have hummed the soundtrack ! Shadow surprises once again, cool work man. Did you spent all that coding-time well hidden in some sort of old computer museum? =). Extremely fluid and smooth. Another platform conquered! too bad the machine lacks decent audio, I don't know how one could abuse the piezo buzzer and make it sound good. You can put an AM radio next to a PET and use interference to make sound. rv6502: Actually (if I have understood the history correctly) the first PET 2001-models didn't have the piezo at all. I wanted to make the demo runnable on a 1977 model, so I opted not to try to use it. Also liked the greets part. Great demo (and it is my own PET, which I filmed with a compact camera). Next target platform would be the CBM-II (B128) series which has video like a 80 column PET but a 2 MHz SID chip onboard so you can get some nice music out of it! You just never give up, do you? =) Really great work, man. Nice to see that someone's keeping the group alive (well, atleast the name since Noice == Shadow nowadays). Wee, not bad considering what the platform gives you :). Of course, platform thumb :) Time to dive into Atari soon Sdw! Cool stuff even without sound! rulez added on the 2010-07-06 21:53:22 by ɧ4ɾɗվ. On the B128 comment - That would be awesome. As I watched this I was thinking "Awesome!" and "A B128 demo like this would kick some mass!" fast, green and mean. one of the few demos i remember form that party. Hopefully the party visitors got to see all of it! @sdw: YT capture of audience reaction. page created in 0.025101 seconds with 15 queries.